Last week I was complaining how it was too hot for this time of year and now it’s getting cold and even in some parts of the country it’s snowing. So what to do when it’s cold outside, of course we make some spicy soup. Well…it doesn’t necessarily have to be spicy it just that I like it that way. Few days ago my hubby gave me a cookbook as a gift, I don’t collect cookbooks but I have nice collection and he knows what to get me. We love noodles around here of any kind but this cookbook was all about Asian noodles and oh I enjoyed reading it from beginning to the end. 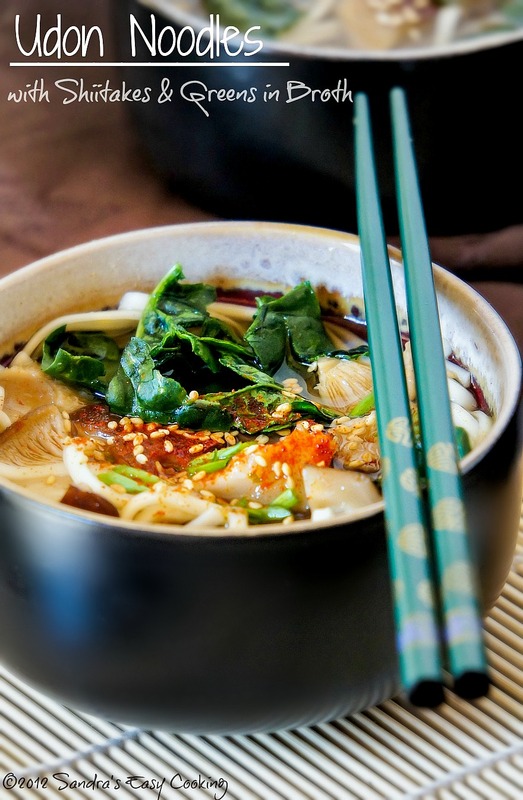 Between Chinese Hot and Sour Soup, Korean Kimchi Ramyeon(Ramen) Soup, this Udon noodle soup climbed right on top among many other Asian soups that I really enjoy eating. It is such a comforting and delicious soup that you have to make it over this season. It is fully vegetarian but for meat lovers you can add some minced pork, beef or even chicken. Simple, Satisfying, Delicious and on top of all warms you up like a blanket. Also if you are unable to find some of the products, which most of them are available in stores, you can order online or substitute with something else for example if you don’t have Shiitake mushrooms you can easily replace it with crimini (baby bella) or white button mushrooms, or if you cannot find Dashi use Vegetable stock. I used Shiitake Dashi which is basically soaking dry Shiitake mushrooms in water and using that stock for making broth rich in flavor. We enjoyed this soup, and even my son loved it with bit of Rice vinegar extra added in his bowl as well as mine. In the original recipe Chrysanthemum Leaves were used and the author gave an option that you can use watercress as a alternative or any other greens. I didn’t make my trip to Asian market to get neither and just used curly or savoy spinach instead. Also she used Kombu Dashi also known as Japanese vegetarian stock– which is dried Kelp(kombu) soaked in water, but I used shiitakes and made it from that. I didn’t omit much from cookbook’s original recipe but it was fine, warm and delicious. Shiitake Dashi (stock): Slightly wash dry Shiitake mushrooms and then place them in a pot and add water, about 5 cups. Soak for about 15 minutes and until they are flexible. Heat the water with Shiitake almost to the boiling point, take it off and let it stand for next 15 more minutes. Take them out of the water with strainer or tongs. Remove all the stems and quarter the lids of the mushrooms. In a larger pot combine Shiitake Stock, soy sauce, mirin, and quartered shiitake lids. Bring to boil over high heat; Reduce the heat to low and simmer until ready to serve. Bring another pot with water to boil and drop the Dry Udon noodles in. Cook as directed on the package. They are just slightly chewy, but not as much as fresh Udon noodles. 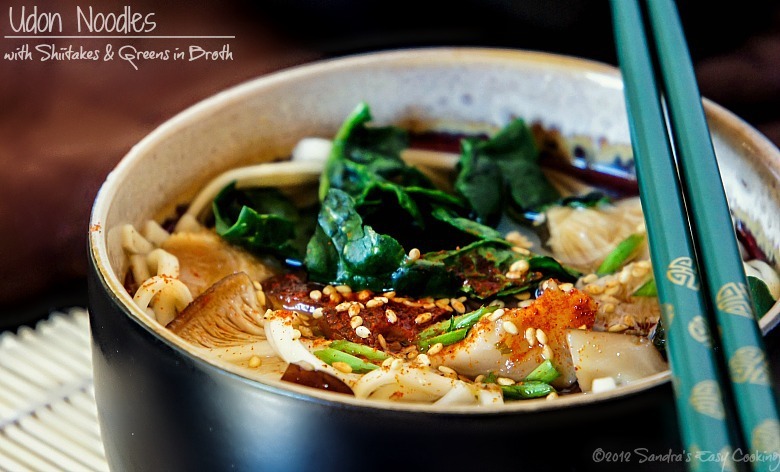 Remember that Udon is not your average noodle, they are thick wheat-flour noodles. After Udon noodles are done, drain and divide among soup bowls. Add your greens to the hot broth and cover for 3-4 minutes, they will be still crunchy. Ladle in each bowl enough broth to cover the noodles, adding Spinach (or other greens), and mushrooms. Garnish it with Green onions, ginger, toasted sesame seeds and togarashi (or cayenne powder) if desired. 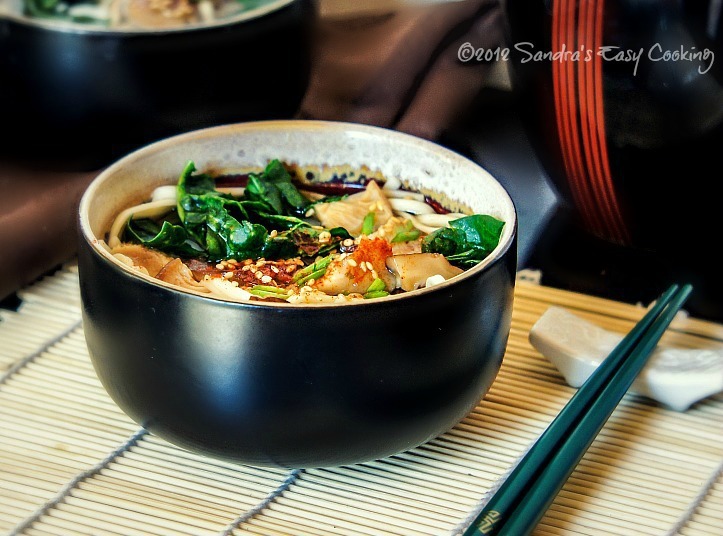 Note* You can find other Dashi Recipes on my friend’s blog Just One Cookbook and many more Japanese dishes. For the sake of the photography I placed chopsticks across the full bowl, however in Japanese table manner laying down chopsticks across the bowl means the sign that you finish eating the dish, but also it can be interpreted that you don’t like the dish and don’t want to eat it anymore. So if you haven’t finished it do not place the chopstick on top and across the bowl, just lay them on the chopstick rest, table or paper pouch/case if any. I want to add that I am thinking about residents of East Coast that are in affected area. I hope that you all are on a safe place! Wishing you safe and warm week! All the images and recipes are ©2012 Sandra’s Easy Cooking. All Rights Reserved. You cannot copy, or republish (recipes or images) without permission of the author.